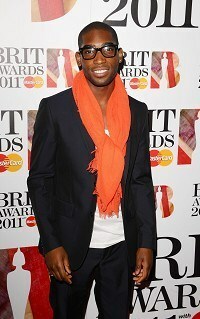 Tinie Tempah has said his dream collaboration would be with fellow British chart topper Adele. The Pass Out star has been hanging out with the Someone Like You singer in Los Angeles as they are both currently touring the US, and is keen to make a record with her. Tinie said: "My dream collaboration at this moment in time is with Adele. I really, really want to work with Adele. I'm trying my best to make it happen so fingers crossed." The 22-year-old Ivor Novello winner revealed he is proud of how well young British artists are doing on the American music scene. Tinie said: "I definitely feel the whole British presence within America at the moment, Adele, Taio [Cruz], myself, Jesse [J], Ellie [Goulding], Eliza [Doolittle], it's going so well over there so I just want to continue making it happen." Tinie hopes to keep making music that speaks to young people. He said: "I feel very much of this generation. I'm only 22-years-old, I'm still learning a lot about myself and making that transition into adulthood. And to be one of the musicians at the forefront of this generation and British culture is insane and I promise to continue putting it into the records and making some really, really good ones, hopefully."